Following our article on Advanced Query Syntax in Windows 7, commenters voiced their frustration with Windows Search. Here, we have a few tweaks you can use to get the functionality you want, but we also consider some alternative search programs. 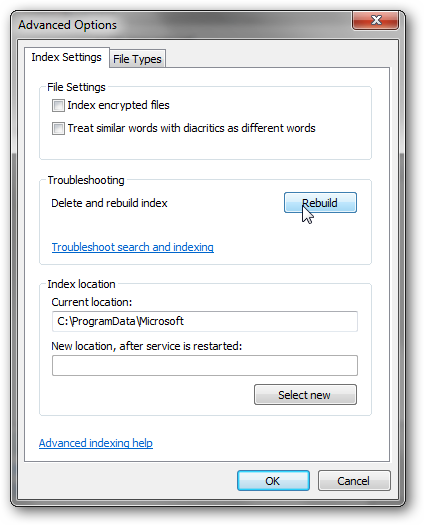 Earlier this week, we showed you how to use Advanced Query Syntax to search in Windows 7. Well, you readers gave us some feedback: Windows XP’s advanced search is much better! 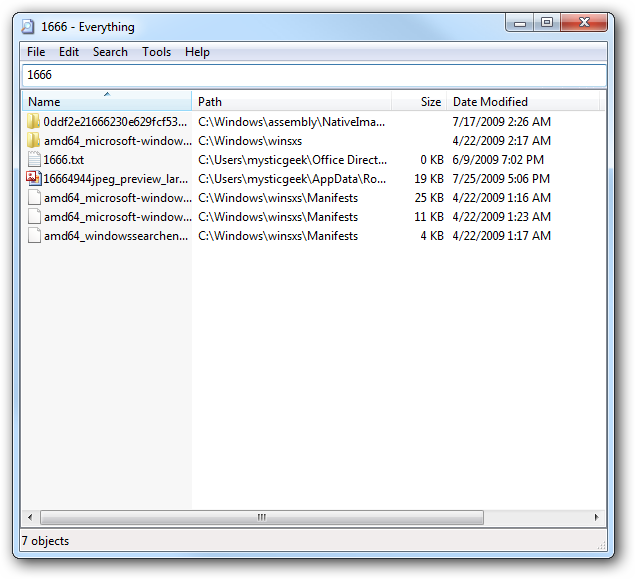 We took a look at some of the common issues and complaints with Windows 7’s search. As it stands, there are a few important quirks that are relevant to searching and using AQS in Windows 7. Let’s take a quick look at some of them. Filters and search results are influenced by your current directory. Many of you pointed out that you didn’t get the same filtering options as in the article when you searched for things yourself. 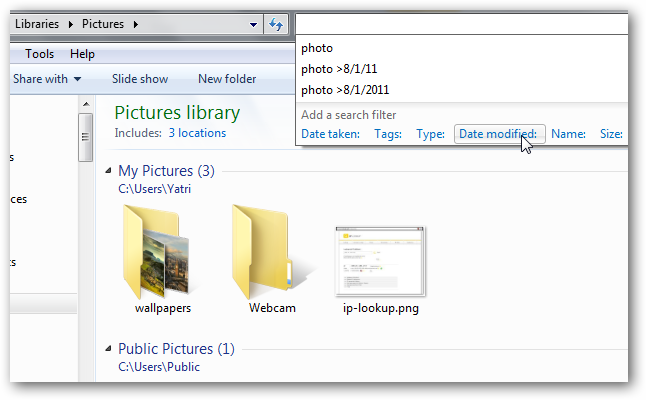 That’s because depending on where you are in Explorer when you search, you will see different default filters. Here, I’m in my Pictures Library. You can see that Windows Search allows me to add the “Name,” “Type,” and “Tags” filters by default here. As you can see, Windows 7 attempts to make things more “intuitive” for you by showing relevant filters from the outset. Of course, you can type in any filter operator at any time, no matter where you are. The clickable options change based on context, though, and there unfortunately no direct way to change this behavior. Results rely on indexed folders. Another important facet in finding files with AQS is indexing. Windows will parse through files for metadata and content based on their type, and then commits that to an index file to make searching happen more quickly. 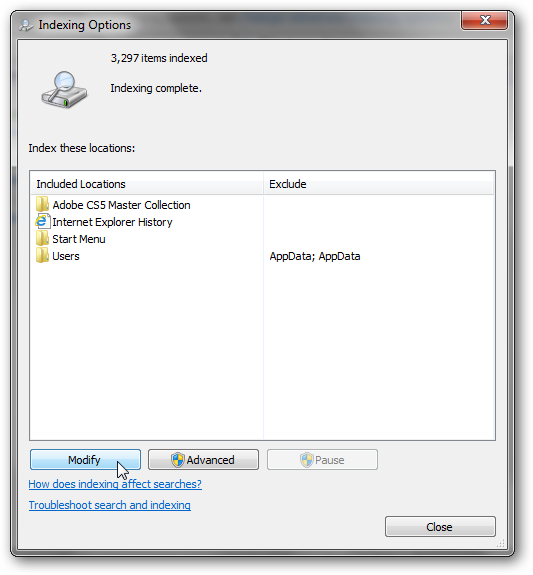 If, however, your desired files are not included in the list of indexed locations, they won’t turn up in the results. You can fix this pretty easily by including your desired folders in one or more Libraries. This is Windows 7’s default way of deciding how to search and determining what’s important. I guess the assumption is that most users will stick to these Libraries or customize them for their needs. Of course, we know that’s not always the case. Alternatively, you can also manually add locations for indexing. Open up control panel, and search for “Indexing Options” and click the link that appears. In the windows that pops up, click on the Modify button. 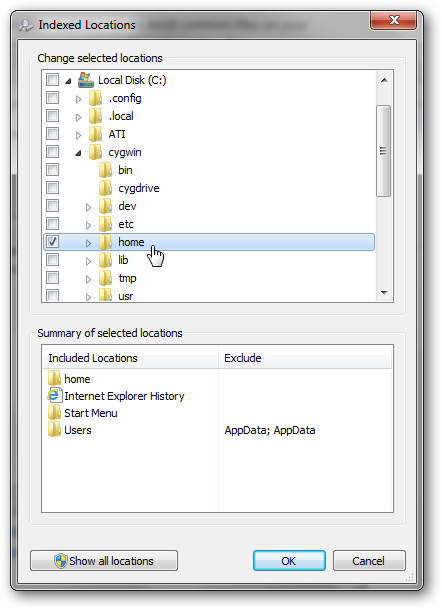 In the new window that appears, you can navigate to specific folders and check them off for inclusion in file Indexing. It’s not a good idea to index your entire C:\ drive, as it will include a lot of unnecessary system files that you probably don’t want quick access to. Your overall searching performance will suffer, as well, due to the large number of files that will be included. You can, however, include another hard drive or partition without having to worry. From the Index Options window, you can also click on the Advanced button. Here, you can modify a few more options and manually rebuild the search index. If you’re having problems with searching for files, you may want to try this and see if the problem clears up. 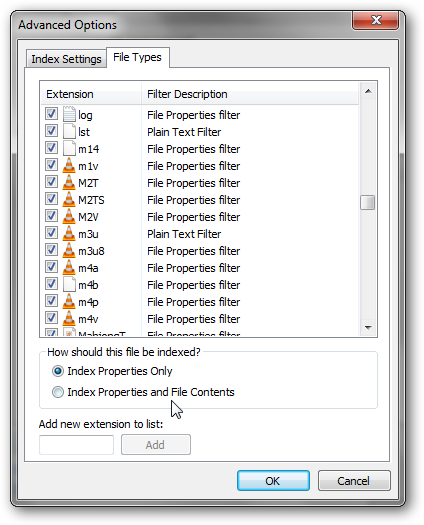 On the File Types tab, you can customize which file types should and should not be included in indexing, and also whether Windows should look at just their properties or at their file contents as well. Lastly, if a folder is marked to be indexed and you have the proper filters in place, there’s only one more thing that will prevent a file from showing up: improper permissions. 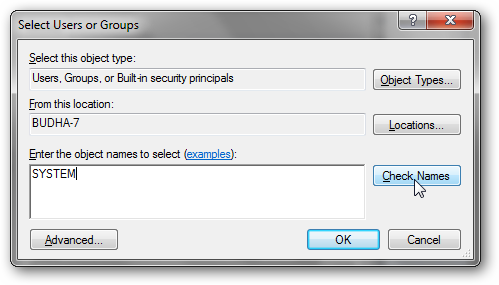 To check this, right-click on the folder in question, click on the Security tab, and see if “SYSTEM” is listed under the group or user names list. If it’s not listed, click the Edit button and then click Add. Type in “SYSTEM” (without the quotes), and then click the Check Names button. If a list of matching names comes up, click on “SYSTEM”. Then click OK at each window until you’re back to Explorer. 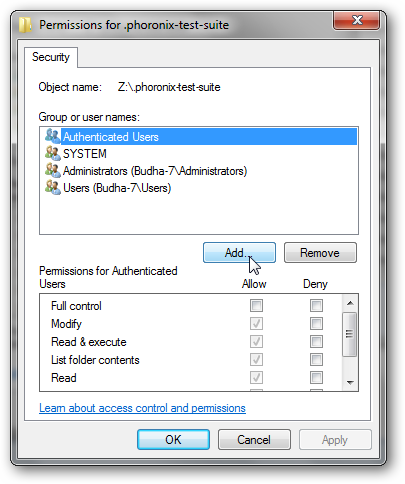 That should give your folder the proper permissions settings. Windows 7’s search is definitely not perfect, at least not for the way many of us use our computers. The above tweaks should help mitigate a lot of the frustration many of us have with the search functionality that Microsoft changed since XP. On the other hand, if you’re left pining for the old-school Advanced Search dialog, then you should consider looking into alternative search replacements. We’ve previously covered how to use Everything. This utility will return folders that match as well as files, one major shortcoming of the built-in search functionality. If you’re on a system that’s not as robust, check out our other recommendation: FileSearchEX. 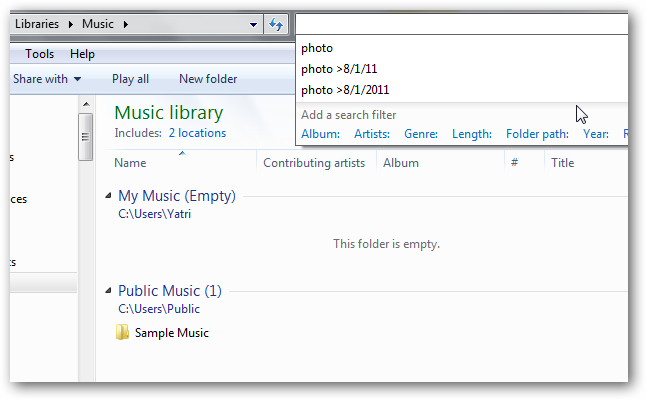 This utility works very much like the Advanced Search pane from Windows XP and is very light on resources. Many of you may not want to give up the ability to parse through file contents, or perhaps you want the ability to use Perl-based regular expressions in your search. In that case, Agent Ransack may be more up your alley. Those of you on higher-end machines can also look into InSight Desktop Search, the biggest powerhouse of desktop search since Google Desktop’s development was shut down. Have these tweaks helped you make amends with Windows 7? Do you prefer another alternative we haven’t mentioned? Chime in below!